As late spring in Seattle warms into a glowing summer, the specter of the rainy season still haunts me…not the least because I haven’t stored all my rain gear yet. Setting aside the superstition that putting away my GoreTex and fenders would somehow beckon rainfall from a clear sky, the technical fabrics used in the waterproof/resistant garments require specific care in order to maintain their properties. Nikwax manufactures a number of products to maintain/restore the performance of technical fabrics. I have a pair of Vittoria Arctica MTB winter cycling shoes. Right around November I start wearing them for commuting because I hate dealing with booties. Sure, for training rides in the rain/cold I’ll pull on the booties along with all the other jackets, base-layers, etc, but I don’t want dressing myself to be a huge ordeal just to get to the store or work. After three long winters of daily use, the Arctica shoes lost a bit of their water-repellency, so I got some Nikwax stuff to right that. Breathable tech fabrics with water-repellent properties should be cleaned with methods/products free of bleach, surfactants, fabric softeners, and perfumes, which often contain oils or waxes that encourage water to wet the fabric rather than bead off. Nikwax Tech Wash is a good product for washing your technical garments. Nikwax also makes a gel specifically for cleaning shoes, but I didn’t actually think that far ahead. 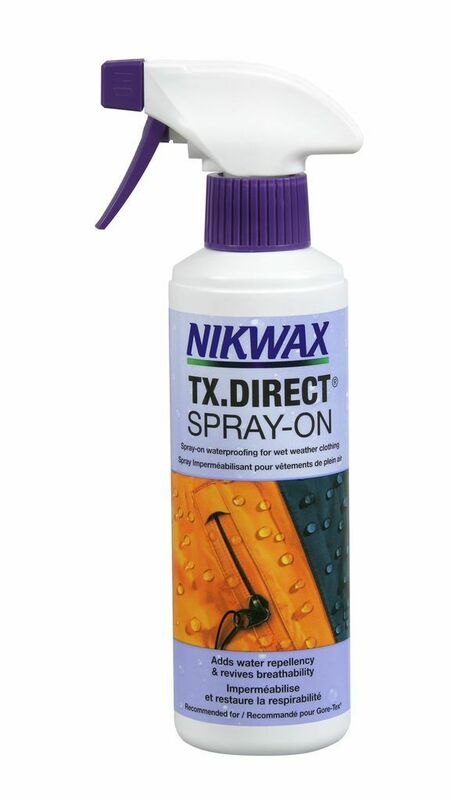 If after cleaning the fabric still wets out, Nikwax’s TX.Direct can be used to restore water repellency. TX.Direct is available in a wash-in bottle or a trigger-pump spray bottle. In the video below, I left the first shoe untreated. As I pour water on the tongue of the shoe, the water beads off just for an instant before it starts soaking into the fabric. In contrast, the treated fabric of the other shoe beads water and even supports a small pool of water without wetting. Good rain gear for riding is expensive, so it really makes sense to take good care of it. After cleaning and treating my rain gear, I can put it in the back of the closet where I hope to not think about it until very late in the fall. And when I bitterly acknowledge that the rainy season has closed out the sunshine, at least I know that my clothing will be in tip-top shape for the long, watery siege.